Ph.D. student Ling Wang explains the graphic display of microbial communities. In the U.S., over 5.4 billion gallons of fats, oils, and grease (FOG) go down the drain, enroute to a wastewater treatment plant. However, FOG could be a useful source of energy to help run the wastewater treatment plants. Dr. Francis de los Reyes and PhD student Ling Wang (MS ENE, 2012) are exploring ways to get micro-organisms to do the work needed to convert FOG to methane. Methane can be used as a fuel to power machinery at a treatment plant. In previous work, Wang and Elvin Hossen (MSENE, 2014) were able to achieve the highest methane yields ever reported for anaerobic co-digestion of wastes that contain fats, oil and grease. Using “step feeding” and another strategy called “pulse feeding”, they were able to develop what seemed to be a “super” bioreactor, increasing methane yield by 336%. In recent work, using DNA sequencing methods, Wang was able to determine which organisms contributed the most to the high performing microbial communities. These results help in figuring out how microbial communities can be actively shaped to achieve a performance goal, such as higher methane yield. The next step is to use RNA analysis to examine the different functional genes involved. The study is an excellent example of how interdisciplinary research – in this case a blend of engineering, ecology, biotechnology and genetics – can lead to potentially significant solutions to environmental and energy problems. The work is funded by the NC Water Resources Research Institute, and Drs. Tarek Aziz and Joel Ducoste are co-investigators. 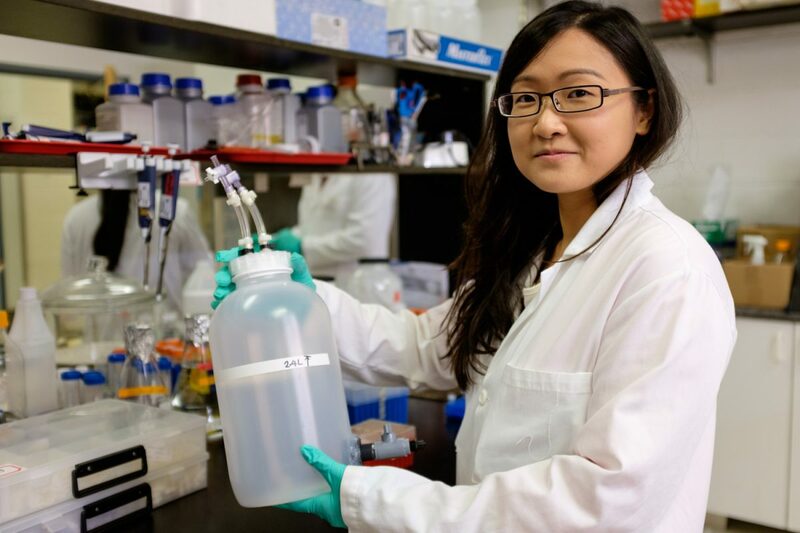 Ling Wang displays a mini-bioreactor similar to those used in the research.